Makin' it in Memphis: A productive weekend. We spent the Thanksgiving break working on the house - Friday was spent painting the den and Saturday was spent unpacking boxes. 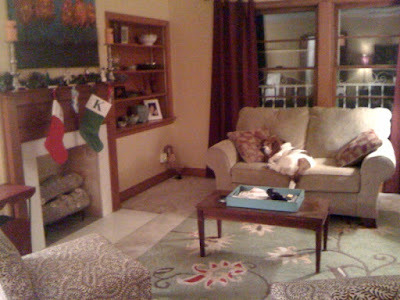 We unearthed our living room and also managed to get a few Christmas items up. We haven't gotten our tree yet though. ps - you have a wonderfully cosy living room! Thank you! I read your comment about Joan Rivers face (its never done..) on one of your posts and feel the same way about this room - when I look at it, all I can see are the shelves I haven't arranged and the carpet that is waiting to be ripped up to unearth existing hardwood. But that is the joy of a house, right?